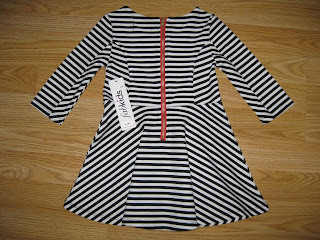 I received my trial outfit from FabKids that I ordered with the coupon in my Citrus Lane box. I knew what outfit I was getting, because I picked it out. But it's still a surprise to see the packaging and I really enjoy that! 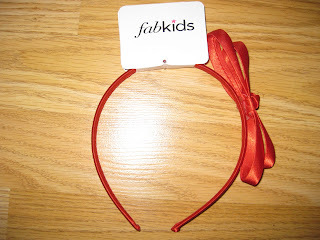 It came in a cute pink box with the FabKids logo. The inside of the box was even better. Cute pink stars everywhere! The clothes were packaged in plastic and there wasn't any tissue paper or any other filler (not that it is necessary for clothing) But it does make the package feel a little more special. I always think of whether I would send these subscriptions as a gift, and packaging is very important to me in that respect. The dress was very cute! 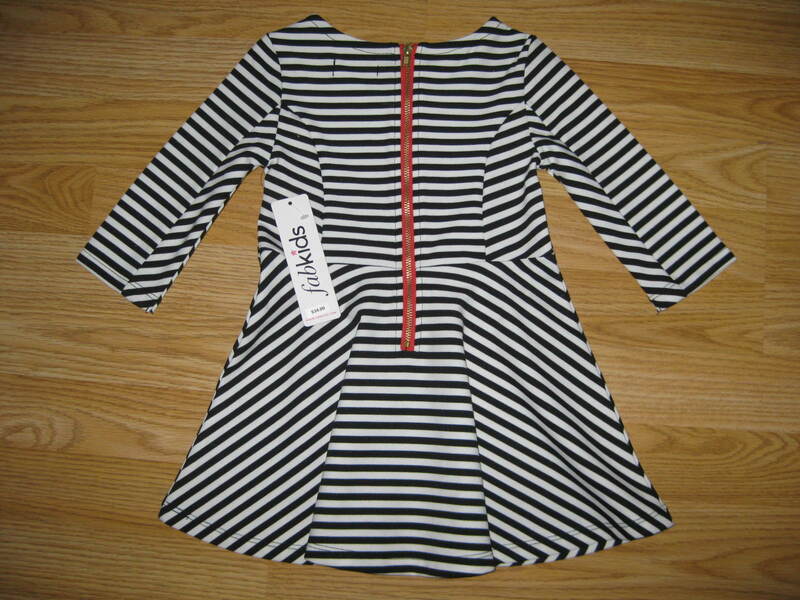 The black and white stripes are a little dizzying, but I think it will be fine. 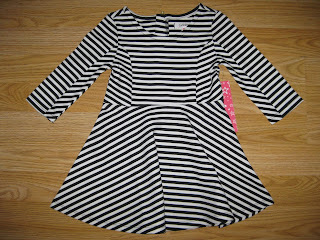 The material is soft and feels comfy for my daughter, but I was hoping there would be a little more stretch. There is also a cute red zipper down the back. It doesn't fit her now, because she is quite small for her age, but I'm hoping it will fit in the winter or next spring. 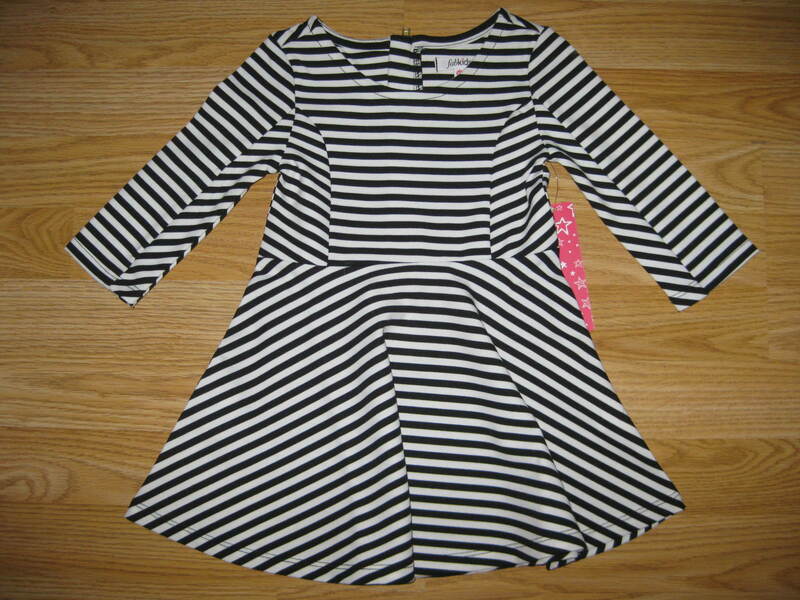 She's going to love twirling around in this dress! The blue leggings are a very nice color and feel extremely comfy. I love putting her in really soft and comfortable clothes she can play in, that still look stylish. So, this outfit is perfect! I can't wait until it fits her. The red headband is a cute accessory with the outfit, but I think it might irritate her when she wears it. I tend to get a headache when I wear those types of headbands, so I probably won't put it on her and expect her to wear it all day. I liked the quality of these pieces and would consider trying it out for a few months if the items fit my daughter now. It is a little pricey if she never ends up fitting into the clothes. Have you tried FabKids? What do you think?? ?